That attitude defines precisely why irresponsible fools like you have held back reform. “Crush them”?? You should be locked up. You’re violent, delusional and a danger to society. If you look at the statistics of people getting drunk at legal public festivals compared to the disturbances at the “4:20” day then you see that the same type of wanker would end up in the back of a paddy wagon at both events. The whole “there are bad people (or stupid arse holes) in every walk of life” has never rung so true. The Tory’s will never reform the misuse of drugs act 1971 because they do not like the way it looks, pure and simple. Clear, need to be looking at an alternative government, especially this close to the election. Why just blatantly lie about the tories? They have said time and time again that they won’t legalise drugs so why just openly say “yeah we’re so close with them.”? Its not as if the Tories have done anything of use for this country except sit on the little man and bend over for the big one. Pete mate your campaign has fallen in a hole, you’re working to essentially **** this country if you think the conservatives will legalise. All they’re gonna do is take away your privacy. There are more individual Tory MPs in favour of legalisation than Labour MPs. It hasn’t come close to being party policy yet but we are making rapid progress. Not all rallies are as you say and I do not think it’s fair to take your dislike out on the organisers because of previous problems. You are fighting for the medical user, not the recreational smoker. This is why I think your article is subject to much unfairness. I speak as both a medical and recreational user and do not like anyone using their position of power to encourage followers, especially when the article contains no evidence. Why have I had the ability to comment and share and like post removed from the Clear Facebook page? If you now plan on removing everyone that has different views to you I am afraid you have lost it. You are killing Clear I really do think it is time for you to move on. The usual reasons for a ban on the CLEAR page are foul language or a personal attack on someone. Our admins make hundreds of such decisions every day. I have no personal knowledge about your particular case. I will come back when the party gets back on track, I brought about 10 members from my group of friends, all will be leaving until things change, my comments only suggested the attitude you are taking as leader is not the most helpful. Peter I don’t know what happened to you but I struggle to to understand why you continue to alienate members, what ever happened to the guy that would blog here about real change? Will you stand down and allow a new leader to be elected, at the end of the day no one is stopping you standing again. Our policies are consistent and have been since I was elected leader in 2011, since when I have been re-elected and won a confidence motion. Under my leadership, our membership has grown to be larger than all other UK drugs policy groups combined. We are very much on track Kevin, making more progress than has ever been made before in the UK and adding new members every day. I have asked for you to be unblocked Kevin. “the ‘togetherness’ buzz. That’s all it is” <– Thats all it is Peter.. We want to know we dont stand alone. Why when we all see the bother with alcohol..Do we keep letting them stomp cannabis into the dark and under the rug? Cannabis folk are not usually outspoken but rather quiet and keep to themselves. Its a good thing.. I think that we cannabis fans should have a day to get together. There are many festivals/dance events every year that serve alcohol and thats ok…why not cannabis? You’ve missed the point Aaron. Alcohol is permitted under the law, cannabis isn’t. No one opposes that more than me and I fully agree with you that cannabis users should be able to enjoy their choice as alcohol users do. However to do that, we have to change the law and these events push that day further back. They damage the cause. Yeah I can see how they would do that damage too. I watched a few videos of all the events at belfast and at hyde park. hyde park had a massive turn out nice to see the numbers but the activites going on were a bit hmm i dont want to say it but it seemed a bit anti-social kinda (druggish, in your face) behaviour even though for the people there it was really good and sociable for them and nice to come out about thier cannabis use… but too people that are somewhat caught in the middle with thier feelings about cannabis they might not see it the same way… but more like a drug fest. I cant wait for the day that i can go for a walk with the headfones on and a smoke to enjoy and not risk gettin in bother with the law or getting a dodgy look because of the stigma attached that came with the prohibiting of cannabis. In your own opinion how far away do ya think that day is? Is 2015 the year they take the handcuffs of the cannabis plant? I believe that we will see reform for some medicinal access early in the new Parliament. As for wider legalisation, it depends what happens after the next US president is inaugurated in January 2017. 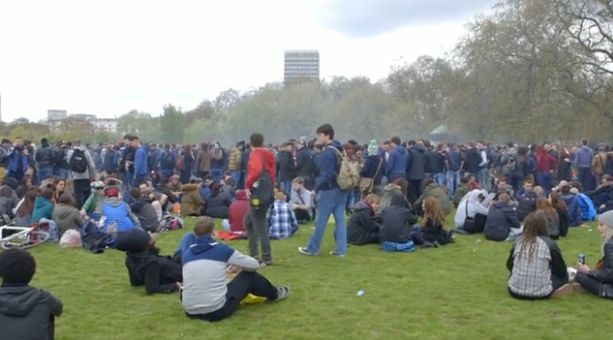 The Free Cannabis Victoria 420 Rally in Melbourne was a great success. There were 4,200 people and a goat present. The police were in attendance and were friendly and polite, smiling and joking with people and even posing for photos with people holding their bongs. There were no arrests. There were no injuries, no arguments, no complaints. Two people lost their wallets, only one was handed in and returned to the owner. I was on the 3:30 news, seen widely across Victoria, talking about the wonderful attitude of respect that was being shown by the police and how they were allowing us to make our protest and that I hoped this attitude of respect would go a long way towards repairing the damage done to police/community relations caused by prohibition. The police liaison officer I spoke with after the event agreed that the event went extremely well and that a crowd of sober people that large would be doing well to be as incident free. We agreed that an approach of mutual respect was the most positive way forward for all parties. The day was a great success on all levels. Wow, Peter, you’ve had nothing but grief on these comments, I’m guessing people who agree aren’t feeling the need to comment, so I’m going to change that trend! I agree with the points you raised. The perception of Marijuana, at least from the people in my area that do not consume the drug, is that its just as bad as any other drug, and whether or not you smoke Marijuana or smoke meth, you’re just a ‘druggie’ and druggies belong together, preferably away from society. These are the people’s minds we need to change, and congregating and smoking in a public place only places us, as a whole, inside this stereotype that people already have, and don’t like/agree with. It tends to be only the ‘angry stoners’ who comment on this sort of post. The silent majority just click like and continue to sign up to CLEAR, donate to us and support what we have shown is proven to work. You wouldn’t believe the vile language, personal attacks and disgusting smears that don’t get through moderation. All this from people who claim to be part of a ‘peaceful, loving community’. You can see it on our Facebook page all the time: ignorant, foul-mouthed, barely literate fools who personify the reason why a large section of the general public remain hostile to cannabis. It’s very depressing at times but my colleagues and I remain on course. Thanks for your support and encouragement. It’s a shame that you seem to need to be part of the oppression of cannabis users Peter. Nobody respects that. Yes Matt, I’m “part of the oppression of cannabis users” am I? What great insight into my life and work led you to this conclusion? I must be missing something. You just like to be the centre of attention, it’s why you always like to go against the grain and insult, grass and harm genuine campaigners, you are a disgrace! Protests causes damage to the cannabis campaign.